New Jersey Crosses the Border! PTXC 6 Recap! 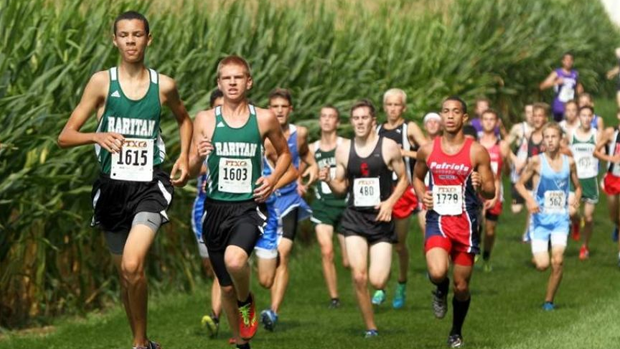 Donovan Hackley and Joe Bitto of Raritan lead the way to a solid team performance. / Photo by Patty Morgan Photography for MileSplit. In the boys blue race we saw all four of New Jersey's visiting teams. The best finish of the day for us was Donovan Hackley of Raritan, who is only a sophomore, coming through the chute in fifth with a time of 17:35. Not too far behind him was teammate Joe Bitto who placed ninth with a time of 17:43. These two would lay the ground work for an impressive showing by the Raritan boys who took 12th as a team with 345 points and a team average of 19:17. They would go 5-9-85-105-141 on the day. Also in the top 15 was a runner from Secaucus, senior Shaun O'Brien took 12th with a time of 17:49. He would lead his team to a 17th place finish with 455 points and a 20:00 average. Paul VI top runner was senior William Schmidt who placed 18th with a time of 17:59. Below the girls recap you will find the entire stat lines for the Jersey boys team performances. The first girls runner for the garden state to finish was the Secaucus junior Roshini Patel who finished 52nd overall with a time of 22:59. The Secaucus team would finish 21st with 505 points, 51-89-116-123-126. Hasbrouck Heights was slightly ahead of Secaucus in the team rankings with a 19th place finish and 468 points. They were led by junior Danielle Dallara in 56th with a time of 23:10, not too far behind was teammate Hailey Ross who took 73rd with a time of 23:42. Full team performances are listed below. Follow NJ MileSplit on Twitter and Facebook!